K Carberry: Help! I need something upholstered! I have never taken a thing to have re-covered. I know that it's not super cheap, but I truly have no idea how much to even GUESStimate this would cost. For those of you who have had something re-upholstered before, can you give me an IDEA of what to expect? 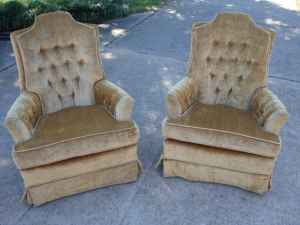 Look @ these fabulous chairs I found....the seller wants $50...FOR BOTH!